Accuweather said this Sunday will be delightful; come be delighted with us by all the beautiful summer fruits and vegetables arriving at Brighton Farmers’ Market. Fellenz Family Farm is bringing lots of summer squash, beets, raspberries, garlic scapes, lettuce, freshly-cut herbs, and Wild Thistle Herbal products. K&S Bischoping will have the first gooseberries and red and white currants of the season, plus red raspberries and a good selection of apples. 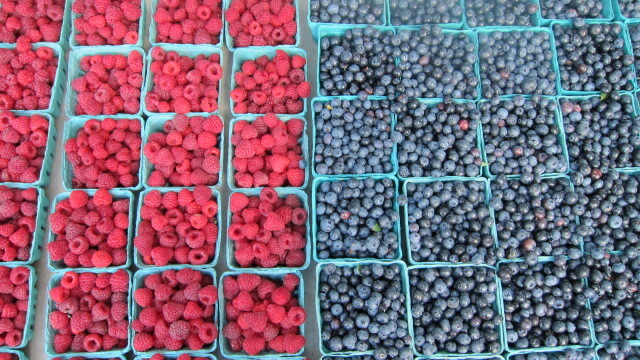 Lagoner Farms is bringing the last of the strawberries, lots of raspberries, blueberries, light and dark sweet cherries, sour cherries, red currants, and apples. Stonecrop Farm will have certified organic fresh whole chickens; chicken parts including breasts, leg quarters, wings, frames, feet, and organ meat; and cuts of pasture-raised pork including chops, shoulder roasts, sausage, bacon, deli ham, bones, fat, and organ meats. Bolton Farms will have lettuce bouquets, arugula, spring mix, butterhead bibb lettuce, watercress, broccoli raab, dandelion greens, bok choi, kale (Tuscan, red Russian, and curly), basil, pea shoots, soil-grown beets, and spicy mix. Chicory Blue Gardens will have lots of sunflowers, snapdragons, and zinnias in bright colors and pretty bouquets. Happy Hooves Organic Farm is bringing 100% grass-fed and grass-finished beef, new cuts of pasture-raised pork, eggs from free-ranging hens, and fresh tender young grilling chickens; all meats and eggs are raised without soy, corn, or wheat and are certified organic. Dearhaven Farm is bringing fresh garlic, black raspberries, black currants, carrots, cabbage, chard, fennel, celery, beets, lettuce, summer squash and zucchini, and fresh herbs, all certified organic and freshly picked. Lighthouse Gardens will have organic cherry tomatoes; red and yellow sweet peppers; lettuce bouquets; garlic scapes; fresh cut herbs; herb and vegetable transplants including tomatoes, lettuces, kales, chards, beets, cole crops, cucumbers, and squashes; an enormous selection of succulents in pots, planters, and hanging baskets; perennials; hostas; herb planters; berry plants; and organic planting soil. Shannon Brook Farm is featuring pasture-raised, heritage breed, organically-processed pork sausages and grass-fed lamb sausages. Growing Family Farms will have certified organic tomatoes (cherry, grape, saladette, and slicing), cucumbers, eggplant, peppers, snow peas, romaine and red butter lettuce, garlic scapes, Italian dandelion, kale, chard, pasture-raised eggs, and Singer Farm Naturals tart cherry juice. Clearview Farm is bringing certified organic fresh spearmint, catnip, garlic scapes, dried herbs, organic eggs, dried black beans, buckwheat, and 100% grass-grown beef in a variety of cuts. Tripleberry Farm will have its first pesticide-free blueberries of the season, pesticide-free red raspberries, and traditional and reduced sugar jams, with fresh batches of strawberry and raspberry jams. Seaway Trail Honey is bringing spring to fall seasonal honeys and honeycomb, certified Kosher, cute mini bears, nuts in honey, infused honeys, pure beeswax, and candles, all from the small scale, small batch apiary near Pultneyville by Lake Ontario. Andy’s Specialty Garlic & Produce will have certified organic vine-ripe tomatoes, spinach, salad mix, arugula, red and romaine lettuce, red beets, green summer cabbage, radishes, turnips, pea and sunflower shoots, fresh garlic, garlic scapes, basil, and cilantro. Eat Me Ice Cream is bringing a variety of dairy and dairy-free ice cream bars and is featuring local strawberry ice cream in pints, dairy and dairy-free. Lavender Moon is bringing Bug Off and Tick Me Off repellents; try a taste of refreshing hibiscus cooler tea. Newbury Park Pastries will have chicken, shrimp and grits, veggie, and panang pot pies along with proper pork pies and seasonal sweet pies and cut out cookies. Brian’s Kitchen is bringing peanut and chocolate chip granola bars, almond and coconut granola bars, chocolate fudge (plain and with walnuts), cookies (all dairy-free, some gluten-free and vegan), and reusable bags. Pasta Classics will have ravioli flavors including kalamata, feta, & sun dried tomato; meatball; and three cheese; plus fresh cut pasta and a wide variety of strombolis. Flour City Pasta puts the hot right in the pasta — Jon will have Reaper Madness ramen noodles, made with hot Carolina Reaper peppers. RocBucha will have bottled kombucha in ginger, blueberry mint, strawberry basil, and pineapple ginger, and on tap ginger, blueberry mint, and cherry sage, featuring cherries from Lagoner Farms. Fuego Coffee is featuring a special drink, cold brew shandy — half cold brew, half lemonade (Emily says “trust us, it’s delicious”). JonJohn’s Bakery is bringing mom’s mac & cheese, blueberry and mixed berry muffins, peanut butter balls, grandma’s breakfast cake, triple layer lemon blueberry cake, peanut butter chocolate brownie muffins, decadent chocolate brownies with Oreo cookies ans peanut butter cups, and a mixed berry cobbler. We welcome Watkins & The Rapiers to the music tent. Volunteers from Campaign for NY Health will offer information about its mission. Brighton Farmers’ Market is held Sundays, 9 am to 1 pm in the Brighton High School parking lot, 1150 Winton Rd. S., Rochester. The Market is sponsored by the Town of Brighton. More information about the market can be found at https://brightonfarmersmarket.org or on the Market’s Facebook page.